Updated 9/24/2017 The animation director for this episode was Yoshihiro Sugai, who had previously done key animation for Neon Genesis Evangelion, several Lupin III movies, and Miyuki-chan in Wonderland. 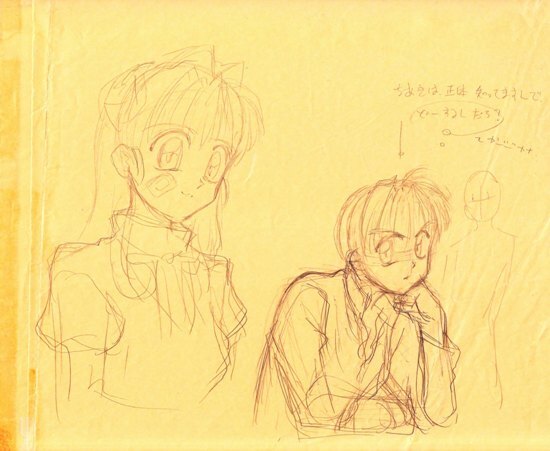 He also was animation director for two episodes of Serial Experiments Lain. Sugai has one of the most distinctive styles among the KKJ artists, using a flurry of very fine, faint pencil lines to build up the characters. The sketch above is likely his, as it is very similar in style to one seen later from Ep. 37, for which he also served as AD. The note above Chiaki briefly sums up what this character is thinking: "He knows the truth: 'What is she going to do?' "
Thank goodness eucalyptus oil takes everything out!